On a brighter note, I have been waiting for Stampin’ Up! to post all the winning projects submitted for the Artisan Award. It is finally on the Demo Website. My Business>My Business Resources>Stampin’ Up! Publications>On Stage…scroll down and to the right are the names of the winners. Click on names to see all winning entries. I love this picture of my daughter Morgan. She’s smiling & happy…but this was a sad day for us as this pic was taken before we left to go to her grandmother’s funeral. I comforted her and offered support. I was just happy to capture a smile from her on this day as she was truly aching inside. Also, hard to capture a teen girl in a pic with her mom. I will definitely cherish this page forever! Okay…the details. Where to start. The page is just an 8-1/2″ x 11″ piece of Purely Pomegranate Textured CS horizontally with Basic Black CS measuring 8″ x 10-1/2″ layered on top. There’s a piece of Certainly Celery Prints DSP 3″ x 10-1/4″ going across the page. 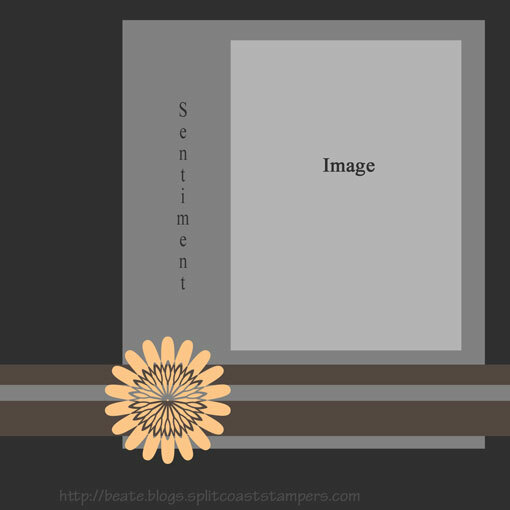 Sentiment piece is 3-1/8″ x 4-5/8″ Groovy Guava Textured CS with 3″ x 4-1/2″ Purely Pomegranate Prints DSP layered on top. Stamped happy sentiment from Define Your Life stamp set. Applied Stazon Jet Black ink to “h” chipboard letter from On Board Lots of Letters, applied Versamark Ink & Crystal Clear Embossing Powder, heated to set and attached with Mini Glue Dots. Picture matted on Basic Black CS, Certainly Celery CS, and Groovy Guava Textured CS. I wanted, again, a whimsical feel to the page. The Almost Amethyst Circles were created with my Coluzzle Cutting System. I wanted my daughter to be the main focus so I put a circle over her face..and carried the circle theme by adding additional ones to both corners of the page. The upper right circle runs off of the Basic Black CS and turns to Basic Black when it hits the Purely Pomegranate Textured CS. It is hard to see, but I have a flowing curvy line traveling through the page that was created with my paper-piercing tool…I pushed to tool all the way through the paper to create larger holes. I then filled the holes with Crystal Effects and topped with Dazzling Diamonds Glitter….It is so cool because the Crystal Effects filled the holes and you can see through the page (even cooler when looking at the page with a light source behind it…resembles a Light-Bright Toy because of the Basic Black CS). Hard to see but on the bottom I wheeled my Little Bits wheel in Versamark, applied Crystal Clear Embossing Powder, and heated to set. This wheel coordinates with the Little Flowers Stamp set, so the bottom border is the stamped flowers punched out with a 1/2″ Circle Punch and applied to page with Stampin’ Dimensionals. 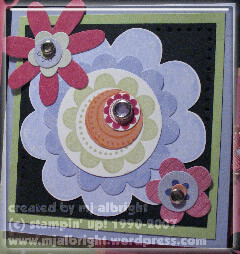 All the other stamped circled flowers are from Big Flowers Stamp Set and punched out with 1-3/8″ Circle Punch. STAMPS USED: Little Flowers, Big Flowers, Little Bits Wheel, Define Your Life, and It’s All Good. CARDSTOCK USED: Purely Pomegranate Textured CS and Prints DSP, Groovy Guava Textured CS, Certainly Celery CS and Prints DSP, Almost Amethyst CS and Prints DSP, Basic Black, Whisper White. INKS USED: Versamark, Basic Black, Purely Pomegranate, Certainly Celery, Groovy Guava, Almost Amethyst, Stazon Jet Black, Basic Black Stampin’ Write Marker. ACCESSORIES USED: Coluzzle Cutting System; 1/2″, 1-1/4″, 1-3/8″ Circle Punches; Scallop Punch; 3/16″ Corner Rounder Punch; Round Tab Punch; Linen Thread; Stampin’ Dimensionals; On Board Lots of Letters; Mini Library Clips; Vintage Black Brads; Certainly Celery 5/8″ Grosgrain Ribbon; Ice Rhinestone Brads; Crystal Effects; Dazzling Diamonds Glitter; Build-A-Flower Accents & Elements Kit; Paper-Piercing Tool, Crystal Clear Embossing Powder. I made this card for Beate’s weekend sketch challenge #20. 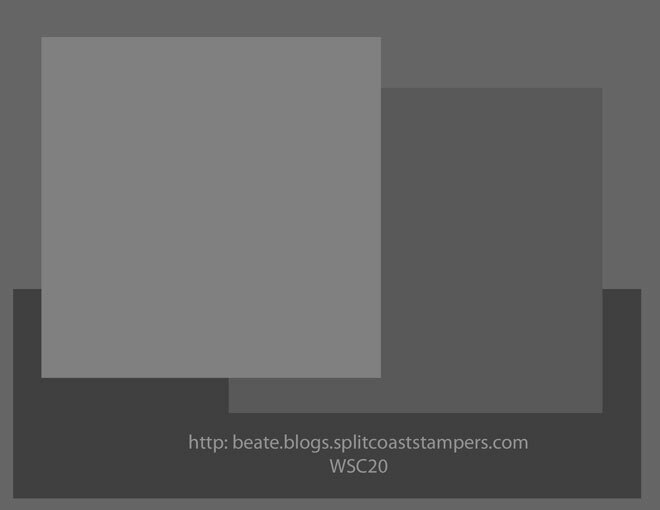 I used the same card dimensions as Beate on her sample card. Card Base: 5-1/2″ x 8-1/2″ Purely Pomegranate CS folded in 1/2 layered with a 4″ x 5-1/4″ piece of Basic Black CS with two top corners Ticket Punched. A piece of Certainly Celery Prints DSP horizontally along bottom of card measures 2-1/4″ x 5″. Stamped swirls from Priceless stamp set with Versamark, applied Crystal Clear Embossing Powder, and heated to set. Added two black brads from Vintage Assortment Brads to top of card base. 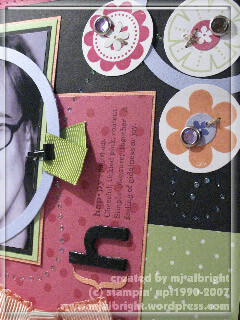 Added a small looped tag of Groovy Guava Ribbon from Sherbert Ribbon Originals to bottom left of card. Sentiment Piece: 2-3/4″ x 3-1/4″ Groovy Guava CS layered with a piece of Purely Pomegranate Prints DSP measuring 2-1/2″ x 3-1/4″ on top. 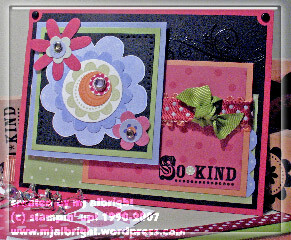 Stamped “So Kind” with Versamark, applied Black Embossing Powder, and heated to set. Stamped a small flower from Little Flowers stamp set and punched out with a 1/4″ Circle Punch and adhered between words of sentiment. Ribbon is layers of Groovy Guava and Purely Pomegranate ribbons from Sherbert Ribbon Originals with a piece of Certainly Celery 5/8″ Grosgrain Ribbon tied around them. 3 scallops created with my 3/16″ Corner Rounder Punch & Almost Amethyst Prints DSP and attached to right lower corner. Main Image Piece: 2-1/2″ Square of Basic Black CS. Certainly Celery CS measuring 2-3/4″ and Almost Amethyst CS measuring 3″ layered beneath the Basic Black piece. I wanted the flowers to be fun, bright, bold, whimsical…just fun!!! The main middle flower is 5 layers total: first larger flower base stamped from Ginormous Flowers stamp set with Almost Amethyst ink on Whisper White CS; second is Almost Amethyst Prints DSP and my Scallop Punch; third is a scalloped flower image from Big Flowers stamped with Certainly Celery ink; forth is a piece of Groovy Guava CS punched with a 3/4″ Circle Punch and stamped dots/circled image from Priceless stamp set; fifth layer is an image from Little Flowers stamp set stamped on Whisper White CS and Purely Pomegranate ink punched out with a 1/2″ Circle Punch. I topped the flower off by adding a Purple Ice Rhinestone Brad to the center. The other two flowers were created with my Build-A-Flower Accents & Elements Kit…again, different layers topped off with a Green Ice Rhinestone Brad. 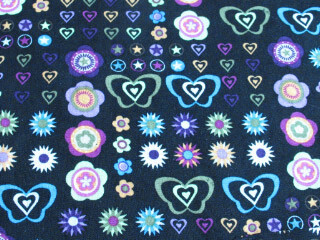 All the elements & layers of the flowers are off-centered just to add a whimspical touch. I paper-pierced the two corners of the Basic Black that didn’t have flowers just for balance. 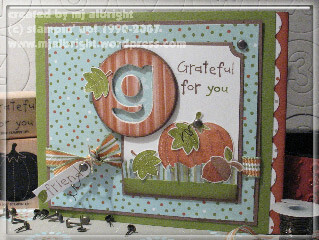 Attached to card with Stampin’ Dimensionals. What a nice surprise in the mail today to get me in the mood for one of my favorite times of year. RAK from SCS’s STAMPIN UP CHICK! Thank you so much. I just love how she stamped the “witches brew steam” on vellum — adds a nice touch of dimension & detail. Silver cord with a touch of black gingham ribbon holds the triangular tri-fold card closed. 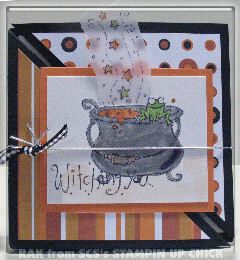 Front sentiment says, “Witching you…”, and inside says, “a haunting halloween.” How cute! I’ve been warned that the Splitcoast daily challenges can be addictive….hum, yep! But, I do like having a template to follow so I can create something daily (for now). I just love my Dotted Autumn & Fall Flowers DSP. The paper lets me incorporate the ever so lovely soft sky into my autumn themed creations. 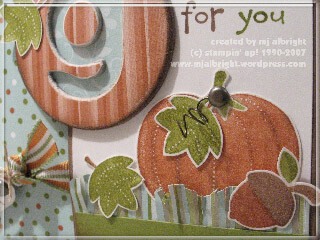 STAMPS USED: Dotted Autumn stamp set & Autumn Dots wheel. CARDSTOCK USED: Old Olive, Really Rust, Whisper White, Shimmery White, Close to Cocoa, Fall Flowers DSP. INKS USED: Old Olive, Really Rust, Close to Cocoa, and Versamark Pad. ACCESSORIES USED: Pewter Brads from Vintage Assortment, Wire Works, Ticket Corner Punch, 3/16″ Corner Rounder Punch, On Board Lots of Letters, Sanding Blocks, Stampin’ Sponges, Linen Thread, Word Window Punch, Ribbon from Jersey Ribbon Originals. This is my first attempt at a Splitcoast Challenge. I never participate because I don’t know all the rules and such. I couldn’t pass this challenge up though. Some of you know me by now, and know that I can’t pass up a great cause! This Tuesdays colors are River Rock, Chocolate Chip, and Really Rust. So ready for fall with these colors. I’ve been waiting to use my Moose You stamp set for the longest time — couldn’t resist with these colors. 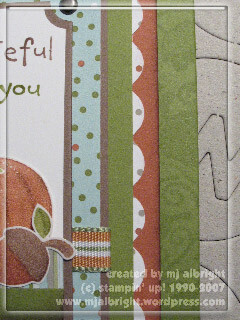 This is a joy-fold card that was created using my Scor-Pal. I made a belly band out of ribbons to hold the card closed. The scalloping is two layers adhered to one another…a layer of DSP & Chocolate Chip CS. All edges are sponged with Chocolate Chip ink. STAMPS USED: Moose You stamp set. CARDSTOCK USED: Apple Cider DSP, Chocolate Chip, River Rock, Really Rust, Whisper White. INKS USED: Chocolate Chip, Really Rust, River Rock. ACCESSORIES USED: Vintage Brads, Chocolate Chip Satin ribbon, River Rock velvet ribbon from Sherbert Ribbon Originals, 3/16″ corner rounder punch, stampin’ sponges. Okay…so I knew that the latest issue of Onstage was to be made available to us SU! demos mid September. I waited and waited. I was so tickled with a melted heart to see my little boys picture in the table of contents and displayed as one of my winning artisan award entries. YOU CAN ALSO SEE HIS PHOTO PUBLISHED IN THE DICTIONARY NEXT TO MISCHIEVOUS!!! The story behind the “Zany” page was that I wanted to capture the perfect portrait of my little Ethan. I chased him around for hours and he kept making faces at me while sticking out his tongue…LOL. I gave up and just went with what he was giving me. I haven’t scrapbooked in over 6 months. 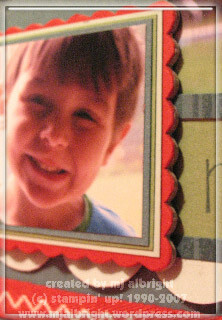 So I took another take on Beate’s weekend sketch challenge and created a 6″ x 6″ scrapbook page of my little Ethan. I had already made a card in my prior post if you would like to scroll down to see a card with her same layout. 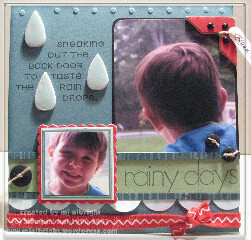 I wanted to create journaling with raindrops incorporated around and within. I used chipboard petals from On Board Blossoms & Basics and covered them with Soft Sky CS and Crystal Effects. For his little 1-3/4″ square pic, I used all colors of cardstock in my theme and mounted on a chipboard scalloped square from On Board Lots of Letters. You can also see the large scalloping created with my Coluzzle Cutting System with Soft Sky DSP. STAMP SETS USED: ABC alphabet lower and Happiness stamp sets. 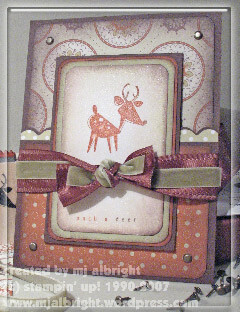 CARDSTOCK USED: Blue Bayou, Wild Wasabi, Real Red, Basic Black, and Soft Sky CS & Prints DSP. INKS USED: Blue Bayou Classic Stampin’ Pad and Basic Black Stampin’ Write Marker. ACCESSORIES USED: On Board Blossoms & Basics and Lots of Letters, Black Brads from Vintage assortment, Black buttons from Earth Elements & Neutrals, Linen Thread, Write me a Memory Volume II fonts CD, Coluzzle Cutting System for large scalloping, Jersey Ribbon Originals, Crop-A-Dile, 3/16″ Corner Rounder Punch, Crystal Effects.